Fish oil is a rich source of omega-3 fatty acids that may help relieve some conditions associated with polycystic ovarian syndrome (PCOS). Studies show fish oil can reduce cholesterol, triglycerides and blood pressure, lowering your chance of heart attack, stroke, or another cardiac event. This is important because of the increased risk for heart disease that exists in women with PCOS. In addition, fish oil has been shown to ease period pain, aid in weight loss, reduce insulin resistance and improve moods, and may even help to prevent miscarriage in certain women. Stored in the fat of coldwater fish, fish oil is an omega-3 polyunsaturated fat that is rich in eicosapentaenoic acid (EPA) and docosahexaenoic acid (DHA). EPA and DHA are essential fatty acids that the body cannot produce and can only come from diet or supplementation. These essential fatty acids are an integral part of cell membranes throughout the body and are a building block for hormones that regulate blood clotting and inflammation. The standard American diet tends to be lacking in omega-3 fats, while also being heavy on omega-6 fats, another polyunsaturated fat. Omega-6s are found primarily in vegetable oils that are widely used in baked goods and fried foods. As a result of this abundance of omega-6 fats in the Western diet, the recommended ratio of omega-6 to omega-3 fats is out of balance. The ideal ratio is around 4 to 1, but Americans typically consume 15 times more omega-6 than omega-3 fats. Women with PCOS should reduce consumption of omega-6 fats while increasing omega-3 intake. To get the health benefits of omega-3 rich fish oil in your diet and improve your omega-6 to omega-3 ratio, you can take fish oil supplements or simply eat more fish. The American Heart Association recommends eating two servings of cold-water fish a week. Mackerel, tuna, salmon, sturgeon, mullet, bluefish, anchovy, sardines, herring, trout, and menhaden are especially rich in omega-3 fatty acids, providing about 1 gram of essential fats per 3.5 ounce serving. Be sure to prepare them grilled or broiled, not fried, to preserve their benefits. Fish oil is quite safe and is generally well tolerated for most people, including pregnant and breastfeeding women when taken in low doses (less than 3 grams per day). Preventing miscarriage in women with antiphospholipid antibody syndrome and a history of miscarriage: 5.1 grams of fish oil per day with a 1.5 EPA:DHA ratio. Painful menstrual periods: a daily dose of EPA 1080 mg and DHA 720 mg. When taking fish oil supplements, some people may experience uncomfortable side effects, such as fishy burps. Taking fish oil with meals or storing supplements in the freezer can help to prevent this. Prior to taking fish oil, you should speak with your doctor to determine if supplementing is right for you and how much you should take. Patients who are on blood thinners like aspirin, Lovenox, coumadin or heparin, should not take fish oil as it may increase the risk of bleeding. Patients taking medication for high blood pressure should also use caution when taking fish oil as the combination may lower blood pressure too much. 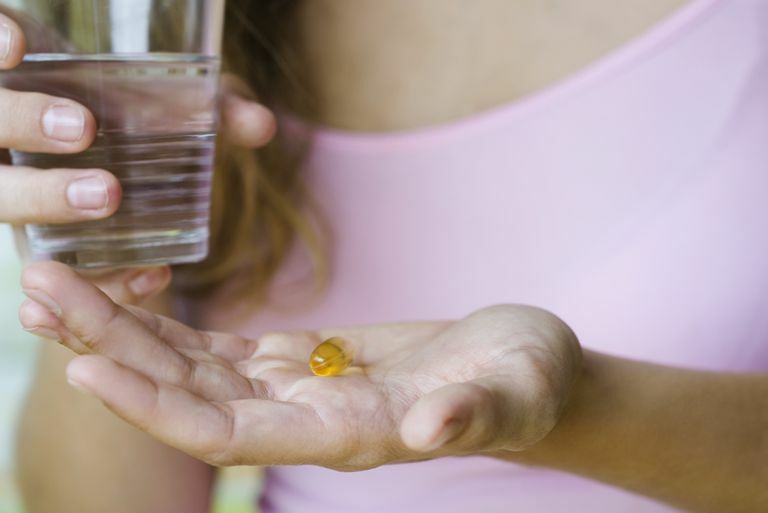 Birth control pills may interfere with the triglyceride-lowering effects of fish oil and women should use caution when combining these drugs. Do not take fish oil supplements if you are allergic to fish. Fish Oil. Medline Plus website. https://www.nlm.nih.gov/medlineplus/druginfo/natural/993.html. Fish and Omega-3 Fatty Acids. American Heart Association website. http://www.heart.org/HEARTORG/GettingHealthy/NutritionCenter/HealthyDietGoals/Fish-and-Omega-3-Fatty-Acids_UCM_303248_Article.jsp#.Vp6kJks3_PA.